Farmers in Wisconsin are often challenged by cool, wet soils in the spring. Many farmers will chisel plow and field cultivate (2x) to prepare a seedbed to overcome these typical soil condition challenges. Over the last 40-50 years some farmers have sought ways to be less aggressive with tillage leaving more residue on the soil surface to protect it from erosion. Often though there is a “yield penalty” for growing corn in reduced tillage and no-till, especially for continuous corn. Strip-till is considered a variation of no-till. 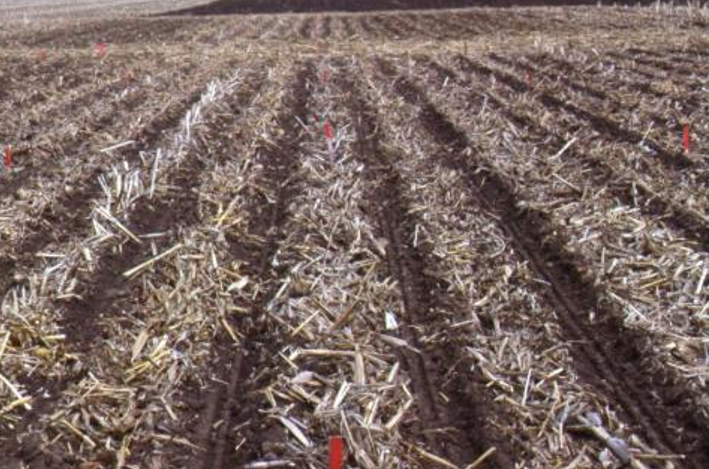 The Conservation Technology Information Center’s definition of no-till includes strip-till, provided less than one-third of the total row area is tilled. In strip-till, an 8-inch band in a 30-inch row spacing is aggressively tilled and fertilized using fluted coulters, knives and berm-forming baskets in either the fall or spring. The objective is to dry out and warm up soil in the seed placement zone before spring planting to encourage more uniform stand emergence and plant density. Figure 1. Corn grain yield response to no-till, strip-till and conventional tillage systems. Data are derived from 2008-2015 at Arlington,WI. Values are means of all split-split-plot treatments. No-till continuous corn yielded the least among the treatments at 164 bu/A. This treatment was used to compare all other treatments as a relative percentage. No-till in rotated corn yielded 6% more than no-till continuous corn (NT CC). Chisel plowing yielded 9-12% more than NT CC. Treatment ST4, yielded 9-10% more than NT CC. 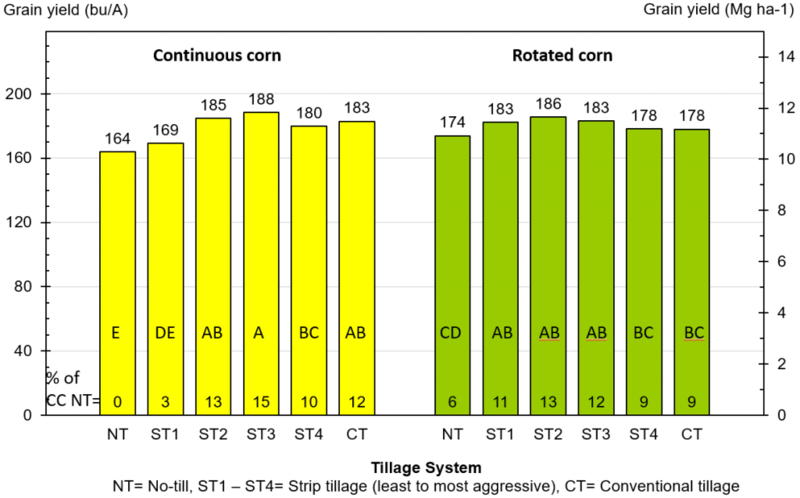 All of the strip-tillage treatments, except ST1 (the least aggressive tillage treatment) in continuous corn, yielded more than NT CC and were comparable to conventional tillage. These data are some long-term evidence that strip-tillage can overcome cool, wet soils in the spring and have the potential to protect soil from erosion with little impact on grain yield. Next post: What about Fungicide on Alfalfa for Dairy Production in Wisconsin?